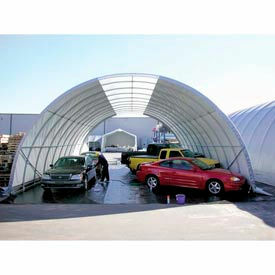 Ideal for boat, hay, grain, sand and salt storage, livestock production, truck and tractor garage and much more. Can be built on any surface in just a few days. Premium 12.5 oz., 24 mil cover reflects light, keeping the building cool in summer, warm in winter and comes with a 15 year warranty. Built-in 6'W white skylight lets the sun shine in. Frame is constructed from 14 gauge Allied Gatorshield structural steel tubing. To provide secure and stable holding power, Anchor Accessories recommended. Choose from Model B354301 B354299 or B381150.